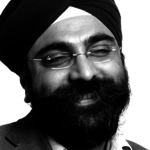 Indy Johar is a co-founder of the Project00.cc Research Laboratory & Skunk Works. Dark Matter labs aims to apply complex systems science to Urban & Regional Renewal; turning what is generally perceived as a threat of our time – spill-over effects across borders, boundaries and silos – into a resource to solve the wicked challenges society faces in the 21st century. Dark Matter Laboratories utilises an experimentation method typical of a fieldwork scientific laboratory, we undertake real-world research and prototyping inorder to seed the next generation of 21st Century institutional infrastructure. We are currently working on a range of initiatives from developing a new class of System Change – Impact funds, to @Town_halls for Social Innovation, to the development of a new generation of Polytechnics, and the transformation of numerous existing institutions. Indy was Director of the Global Impact Hub Association and Impact Hub Islington [the original Impact Hub in the Hub Network] and worked with Jonathan Robinson to design the protocols and modes of the network scaling. Indy has taught & lectured at various institutions from the University of Bath, TU-Berlin; Architectural Association, University College London, Princeton. Indy has written for many national and international publications on the future of design, systems change and social investment.